Samsung introduced their hybrid tablet phone, the Galaxy Note, during a Super Bowl commercial that had everyone singing “I Believe In A Thing Called Love” by the Darkness the next day. At SXSW, I met Jen Friel, who was representing AT&T down there, and she gave me one of 5 Samsung Galaxy Notes that she was giving away in Austin, Texas. Normally when I review a phone, I carry it around with me for a week or two and try to get as much real world experience as I can. The most notable thing about the Galaxy Note was my inability to carry it in my pants pocket. It was fine when I was wearing a jacket or wearing cargo shorts, but I couldn’t simply put the phone in the pocket of my jeans. Screen The screen on the Galaxy Note is a 5.3″ WXGA Super AMOLED HD screen. 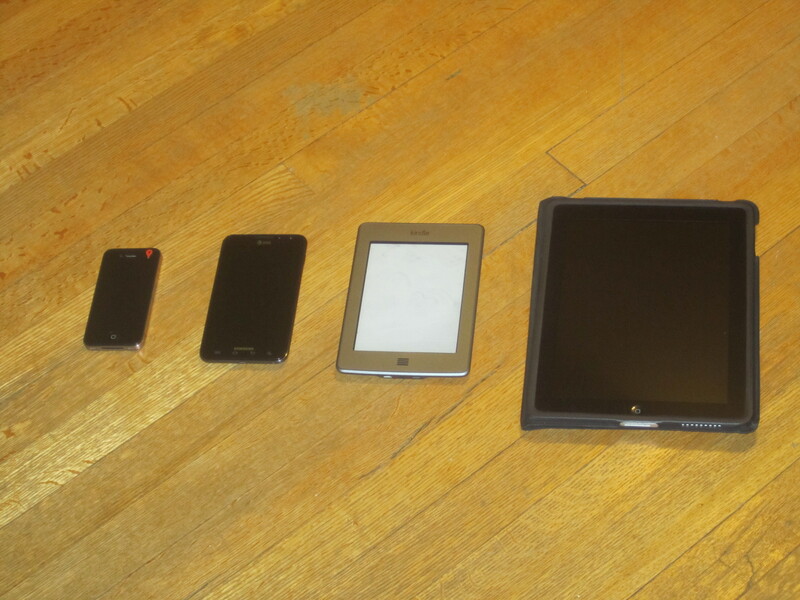 This means that the screen is larger than the average phone but smaller than most tablets. It’s a bit tough to reach to control one handed and I had trouble reaching the entire screen. One handed accessibility aside, the screen was vivid and easy to read, whether I was reading with the Kindle app, playing Angry Birds or watching a video. Applications The available applications for an Android phone are second only that to the iPhone, so there is no problem finding applications to do whatever you want. As a bonus for Angry Birds fans, the new Angry Birds Space has an exclusive level for Samsung Galaxy Note owners and free access to the Danger Zone levels (usually an in-app purchase). One problem I had with the applications was the inability to change the applications in the dock area at the bottom. I would have preferred to swap out apps I don’t use in favor of those I do, but could not find a way to do it. Battery Life The Note has up to 10 hours talk time and 250 hours idle time. I haven’t used the phone to its fullest potential, but the battery was enough for me to read books and stream videos via Netflix for hours. I did not have the 4G LTE turned on (since I had no SIM card), so I don’t know how much more of a drain that would have put on the phone. Like any smartphone, I would still consider charging nightly, since regular usage uses the battery within a day. Camera The Samsung Galaxy Note has a 2MP camera on the front and an 8MP camera with LED flash on the back. The camera took excellent pictures in my tests that were very detailed and vibrant. The phone has no hardware button to activate or trigger the camera, something I really liked on previous Android phones, but the screen is large enough to have a big, easy to use button to trigger the camera. Media Player The standard Android audio and video players that are built into the Android 2.3 Gingerbread operating system and access to Google Play to purchase and stream music. The built-in speaker is passable, but sounds good using external speakers or headphones. If you have a large music collection, the Note can play the MP3, AAC, AMR, WMA, WAV, FLAC and OGG formats, plus it can play the MPEG4, H.263, H.264, DivX, WMV and VC-1 videos formats up to 1080p, giving a lot of options for audio and video content. Keyboard The Galaxy Note has the Android, Samsung and Swype keyboards pre-installed and can be chosen between in the settings. Although there is no physical keyboard, the larger screen gives plenty of real estate for typing with thumbs, but is tough to type with one handed. The Galaxy Note also comes with a stylus to tap out the keyboard or draw onscreen with, which seems like a throwback to the old Palm Pilots rather than the latest technology (but does give an advantage when playing Draw Something). Phone Unfortunately, I did not have an AT&T SIM card in the Samsung Galaxy Note, so I can’t judge how call quality is. Holding the phone up doesn’t feel too uncomfortable, but I don’t know how it would feel for long phone calls and would probably opt to use a headset to alleviate that issue. 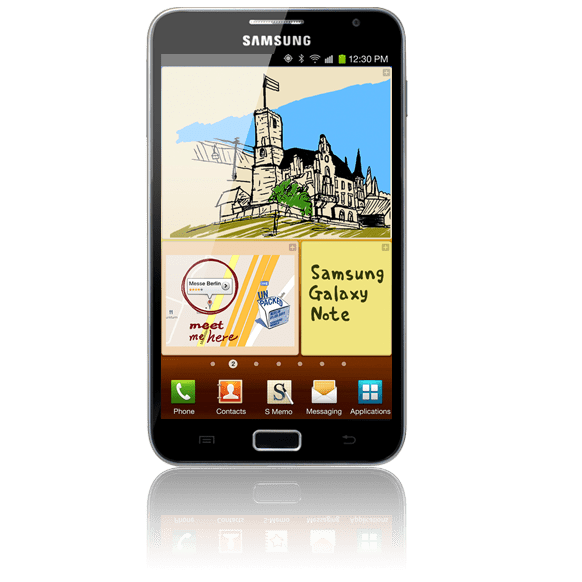 Hardware The Samsung Galaxy Note sports a 1.4 GHz dual core processor and 16 Gb of RAM under the hood to give a very smooth experience. I didn’t find any hiccups or lag that I got from the early Android phones. The phone itself feels sturdy and has the right amount of heft to give it a good feel in my hand. While the Samsung Galaxy Note seems like a solid device and could get more work than a normal sized phone, it’s the size of the phone that makes me hesitate to recommend switching to it as someone’s primary phone. The inability to comfortably carry it without a jacket or bag makes it tough to make someone’s personal phone, but it makes an excellent personal assistant and gaming platform.